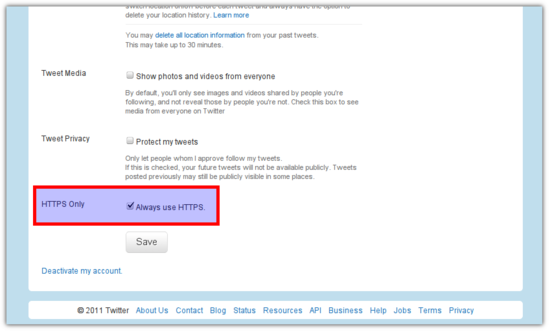 How To Enable HTTPS Security Setting In Twitter? With social network profiles (Facebook, Twitter etc.) becoming very important for a lot of people, the security of these services has also become very important. Recently we have seen applications, like Firesheep, which can steal other's credential when using Facebook, Twitter etc. over unsecure networks like WiFi. Facebook recently revamped its security by allowing users to always use the much safer HTTPS instead of the insecure HTTP. 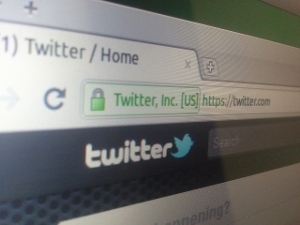 Today, Twitter has also announced that they are now allowing the users to always use HTTPS by default. This will go a long way in improving the security of Twitter users. Twitter recently got some bad press when Ashton Kutcher's Twitter account was hacked recently at TED to highlight the problem with using HTTP. To turn on HTTPS, go to your Twitter profile's Settings, scroll down to the bottom of the page and check the box next to "Always use HTTPS". Then click on Save. HTTPS connection has been available in Twitter for some time. However, before this users had to manually enter https://twitter.com/ to access it. With the new "Always use HTTPS" option enabled, Twitter will always use HTTPS no matter if you enter http or https in the url. Enabling this feature will also force HTTPS when you use Twitter from the iPhone or the iPad app. However it will not automatically use HTTPS when used from the mobile browser yet and users still have to manually go to https://mobile.twitter.com.